This week’s Top 10 Tuesday post gave us the chance to be a bit snarky, which is always fun. 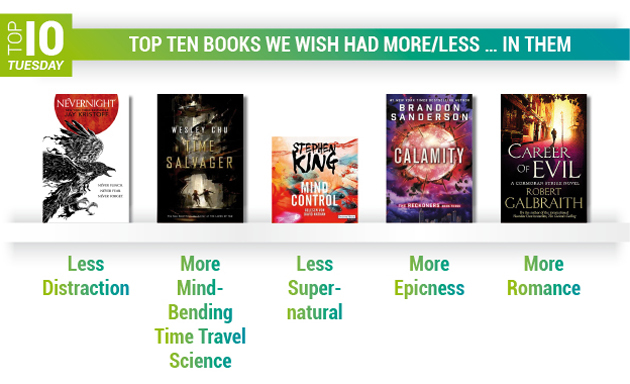 We couldn’t think of enough books to fit a single category, so we changed the topic a bit. Hopefully no one will be too insulted by our opinions. 😉 Also, don’t let our complaints scare you away from these books – some of them are among our favorites! This is an amazing book that everyone should read, but it ends with non-stop action that comes out of nowhere and doesn’t fit with the rest of the book. Let’s be honest: Wouldn’t life have been much less annoying if both Tris and Four had died in the first book of the trilogy so that „Insurgent“ and „Allegiant“ would never have happened? On one hand, this is an addictive read with a fascinating premise. On the other hand, it features a stereotypical YA love triangle that gets in the way of said fascinating premise. It’s hard enough to stay focused while reading without a 200-word footnote right in the middle of every other sentence to distract you. Fun idea, poor execution. „Time Salvager“ is without a doubt an entertaining time travel adventure but it could have been epic with more scientific time paradox mindfuckery. Supernatural elements are to be expected from Stephen King’s novels, but this series was different. King held out until the very end, but apparently he just couldn’t help himself and added in a supernatural twist after all. The first two books in the Reckoners trilogy were truly epic (the pun just never gets old…) but sadly this conclusion was rather rushed and underwhelming – especially since Sanderson has proven with his Mistborn series that he can do much better. Which books would you like to modify a little bit to improve them? Haha, I like how you did this prompt. Completely agree on Calamity (though I wasn’t a fan of the first two either). That ending really lacked a punch. Thanks! 🙂 And yeah, it was pretty disappointing. Although I guess if you didn’t like the first two, there wasn’t much hope you’d like the third, lol. LOL more death in Divergent because Tris and Four were awful. I completely agree. I have only read the first book in the Reckoner’s series and it was quite epic (lol) it’s sad that the epic levels deplete. I think I would like less happy endings in books. I want to be shocked and angry/upset for once when I finish a book! I don’t know if I should recommend finishing the Reckoner’s series or not. I did really like the second book! Haha, I know, it’s so rare when books don’t end happily, which obviously isn’t realistic. I can only think of a few authors who actually kill off their main characters. There are more who threaten it, but they never follow through. I hope you’re not discouraged now to continue to the Reckoners series. „Calamity“ was still a good and entertaining book but the ending just couldn’t live up to the rest of the series. And YES to evil and shocking endings! I want to actually fear for the protagonist’s safety and not always be sure they’ll make it through the story anyway! I love how you did this!!! I so agree for more romance in Career of Evil!! Woohoo, I’m glad you agree about Career of Evil. I’m so impatient to see what happens in the next book. Sebastian and I aren’t 100% in agreement about how things ended in Career of Evil. I really hope book 4 will make some progress on Robin’s and Cormoran’s relationship, especially after THAT „Career of Evil“ ending! I haven’t read any of these, but I love the blurb you’ve written about each. I think these type of posts are my favourite to read. More snark, please. You can never have too much XD. I did not enjoy the love triangle in The Naturals. You’re right, it did really take away from the story. It would have been nice for a certain character to accept that the protagonist wasn’t interested in him earlier on though. Great list! I hope the love triangle is over in the next book! Have you already finished the series? I really enjoyed Nevernight, but I have to agree – the footnotes took a good bit of getting used to, and even then I skimmed a few. Yeah, I definitely skimmed a lot of them. /o\ I wonder if there will be as many in the sequel. A few footnotes would have been okay, but that was just too much and too long and there were times when the footnotes made me want to throw the book against a wall, that’s how annoying I found them – especially because I felt like they didn’t add anything valuable to the plot. The footnotes were most of the reason I stopped reading Nevernight, they got annoying! There definitely should have been more death in Divergent. I was really close to stop reading „Nevernight“, too, but I’m glad I read on because there were way fewer footnotes in the second half of the book so that I could finally enjoy the story. I hope the sequel makes up for it! Have you already read it? I love your take on this prompt! I agree about Nevernight – a lot of the footnotes seemed like unnecessary tangents, to the point that I started ignoring them. I do like the idea of stashing away the world-building somewhere other than the main text though, as it keeps the action flowing if you don’t stop to read the footnotes. Also, yes to more romance in Career of Evil! I might have cried ’noooo‘ out loud at that ending. 😛 Fingers crossed Matthew will be gone in the next book!